Not worried about size or weight (understanding the Milly is significantly heavier than the Zenith). Just curious where people might stand on the two... if you could only choose one. I’d go with the Zenith. I’ve really admired the Defy for a while. Plus I’m not a fan of the Milgauss. Milgauss for me. Not a fan of zenith's styling. Ok, few considerations. First, what other watches do you own? Secondly, If it was something other than a milgauss like a 5 digit sub or sea dweller or a GS then I would go with that. But if milgauss must remain a choice, then zenith for me. I have a tough time finding the Defy's hands. I want to like it, but I don't like to work to tell time. I agree, whoever buys the Zenith is going to buy it for the story and the movement. Cool watch. I've never seen the piece in the metal, so legibility may be better than pics show; but I agree, I would want it for the story and the movement. I have a 14060 Sub that I'll always keep and a Breitling (first good watch) that I'll keep.The Milgauss was the newest addition and while I loved it at first, now that the honeymoon is over I just like it a lot - which means it's on the docket for something else if I can find that piece. I think the Zenith is different and I appreciate the history of the brand and their quality. Aesthetically the El Primero dials never did much for me but the Defy Openwork I find really interesting. i didn't even know they had watches in Nebraska! I have and adore the white Milgauss. It is such a fun watch. I have a Rubber-B black and orange strap, which entirely changes the look of the watch and gives you more options. Went to local AD and saw the Zenith in the metal today. The skeleton dial was really cool but I think it might get old after a while, and it wasn’t as easy as I thought it’d be to tell the time. Minor detail? The solid blue dial variant though on the titanium bracelet was awesome. Am seriously considering selling my white dial Milgauss to go that route. Decisions decisions. Thanks everyone for your replies. . Even though it’s one of my least-favourite Rolex models, I’d still take the Milgauss any day over that particular Zenith. Milgauss over defy. I put my black on a black carbon fiber strap and love it. However, I love Zenith too, just not the defy, it's visually too much for me. Now, the Zenith tri-color I have, WOW, love it. But if the choice is defy or Milly, then Milly all day. I like the idea of the defy, but I found the open dial version too symmetrical / industrial, lacks artistic design. I don't know how to pin point it, but it looks they are doing a open dial just for the sake of doing it. The simple blue dial looks lot nicer for me. Ok, the Milgauss is not going to win any beauty contest neither, but I just love it because its so not-a-Rolex. That orange thunder bolt hand is a love it or hate it thing. You be the judge of that. And consider the white Milgauss having no lume, cause the lume just doesn't work well. Otherwise, in the sea of _________ (filled in your fav popular Rolex models), Milgauss remains to be the few Rolexes that I found more interesting. I don’t know much about watch beauty contests, but that Milgauss sure looks good to me in that photo, and even better in the very rare occasions when I’ve seen one in the wild. I would go with the Zenith, the dial is absolutely amazing. For me the Zenith because it's unique from all the other watches I have. I'd pick Zenith for sure. This coming from a Rolex fanboy too. i see you're from California. 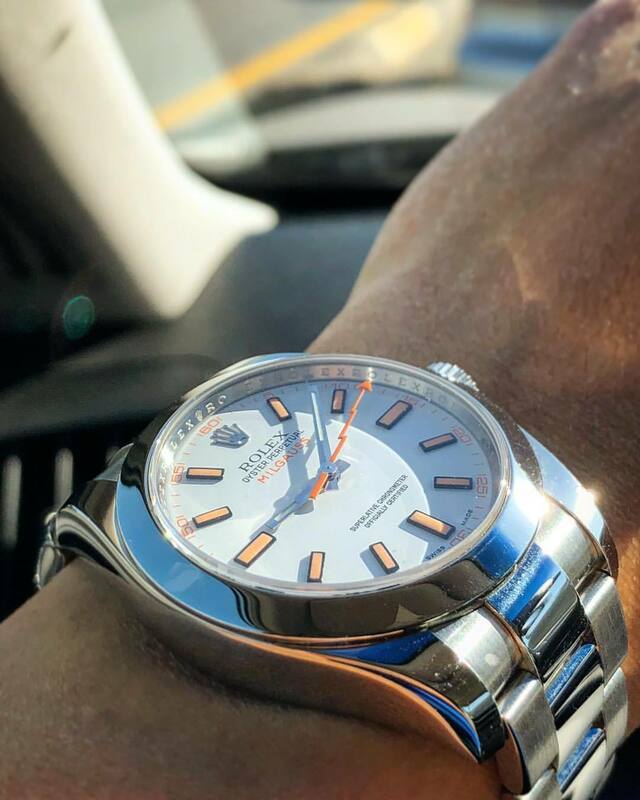 nice coincidence as that while milgauss with it's warm tan markers absolutely screams a gorgeous California aura.